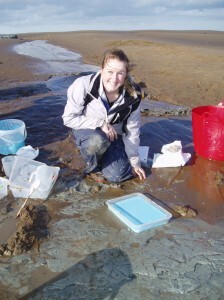 The December 2012 edition of the National Geographic includes an article on Reading University’s Mesolithic research in the Severn Estuary, South Wales. In preparation for the article the National Geographic sent two photographers from New York and a journalist from Switzerland to work with the Reading University team. The article concerns the effects of the sea level rise as ice melted following the last glaciation. Sea level rise drowned Doggerland, which once connected Britain to continental Europe, and also drowned many coastal areas around Britain leading to the formation of the Severn Estuary. Work here takes place at extreme spring tide in a narrow tidal window when sites are exposed for about 90 minutes and recording has to be rapid. 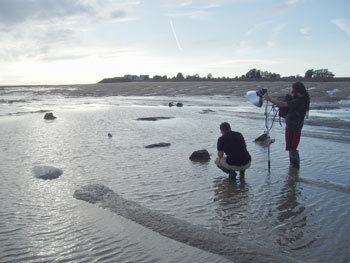 Ten minutes before the tide came in a well-preserved Mesolithic footprint was discovered; the National Geographic photographers were on hand to record the discovery which features in the article and the Reading team moved in to cast the footprint for eventual museum display with the tide rising around them. The footprints are 7500 years old and are of great interest in telling the team about patterns of past human movement, relating both to settlements which have been excavated and trails converging on other campsites now lost by erosion. Many of the footprints were those of children, some as young as four, showing that in the hunter-gatherer communities of the Mesolithic children played an active role in the day to day foraging activities of the community. The iPad version of the National Geographic shows a time lapse sequence with the tide retreating and then returning as the Reading team rush around like ants to record footprints and artefacts exposed by the low tide. The title page image for the National Geographic article shows a fine reconstruction painting which they commissioned showing one of the four successive areas of Mesolithic settlement which the Reading team have excavated at Goldcliff. Returning to the site in summer 2012 the Reading team found a new area of Mesolithic activity, a discovery which was filmed for a Channel 4 Time Team special programme to be broadcast in Spring 2013 on a similar Doggerland theme to the National Geographic article. The National Geographic claims a worldwide readership of 40 million in 34 languages, the inclusion of Reading University work in this article and the Time Team programme takes our research to audiences which are not reached by standard academic publications. Wide public awareness is particularly important at a time when the House of Commons Select Committee on Climate Change is once again considering a Severn Tidal Barrage. Such a scheme would have a major impact on the rich archaeological resource of the Severn Estuary which Reading University has played a key role in identifying.